In the wild I have seen Heuchera maxima, one of the parents of Heuchera Santa Ana Cardinal on shady north facing slopes. I have grown them in the garden in dry shady conditions and they are on my list of dry shade favorites. Heuchera Santa Ana Cardinal is a cross including the island alum root as one of its parents. It is a little larger than the other red flowered varieties that I have seen. Heuchera Santa Ana Cardinal puts out a knockout round of bloom in the spring and a smattering of flowers the remainder of the year. For me Heuchera Santa Ana Cardinal has been a particularly floriferous variety. It has larger leaves than Heuchera firefly. 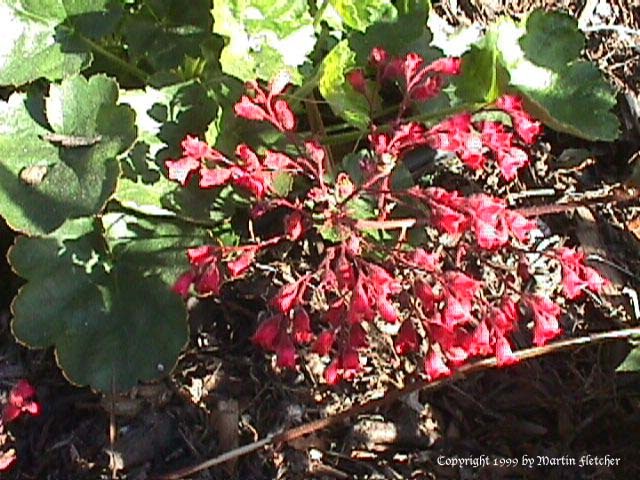 Red flowers and foliage of Heuchera Santa Ana Cardinal - Santa Ana Cardinal Coral Bells.